Totally fixed my steering stem and now steering is incredibly smooth and less work. Great fitment and outliving oem. Pain to get the old ones out and these took a bit to install, with the right tools this will work perfect for the job. There as good if not better than OEM in my opinion with out the cost. Proper care and maintenance is key like all working/moving parts on a dirt bike. Bearings seem to be quality and fit correctly. BUT I had to cross reference their part number with Suzuki's to figure out top and bottom. Could have just written it on there for us? Also, dust seals are correct for bearing size, but bind on the bike (gets crushed by clamps.) 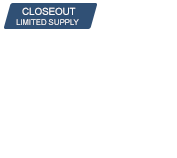 So make sure to order the oem top seal if you're getting the kit for your 2003 Suzuki rm85. So call this a "kit" is a bit misleading. More like two bearings with some seals you immediately throw away. I used these bearings while I was rebuilding the front end and they fit great. Bearings are smooth and the front turns with ease again. Easy installation, simple adjustments, works awesome! Highly recommeneds for all your needs. Very durable and great price. Smooth Steering with All Balls! Never had a bad All Balls bearing kit, fit just how it should. Seals are a little different than OEM, but still fit/function correctly. Easy to install, didn't need any fancy tools. Came with some extra parts so that was confusing. I just put it together the way it came apart. Works good so far. can't say much on how they perform or reliability, but they fit well on my DRZ and smooth!! Perfect fit, and a nice upgrade from the original ball bearings on the Ducati Monster. I can’t really say anything about the longevity I haven’t put enough miles on it but the quality seems great. Top Quality parts, at a great price! RMATV always has been the go to place for all of my parts!! AND the give back !!!!!!!!!!!!! Cheep but still overpriced. Too small of bearing. The lower bearing is cheep and small. The rollers are halt the size of OEM. Great bearing kit fit like oem. Will buy it for my next bike. All Balls is the best. This kit was definatley worth the money. Installation was difficult, but that's due to the age and condition of the bearing that was already in the atv, not the product itself. Steering is silky smooth now. Good fit should be fine no issues with other all balls products. Recommend yep! Plan to regrease every other year. Not as good as OEM but well worth the price. I use these in steering systems without issue. Man what a difference these made to my steering. Were as advertised and love the smooth operation. I have bought these bearings for multiple bikes and have never had any issues with them. They fit good and hold up to all the mx racing and woods riding I do. 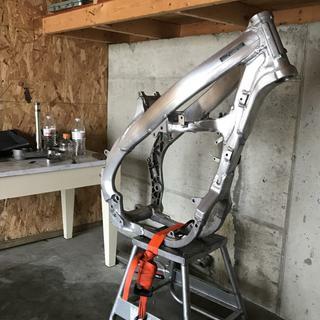 Restoring a '93 CR250 that had been parked out in the Oregon weather. Every bearing needs replaced. Rocky Mountain had these All Balls steering bearings which is where I started after the frame came back from powder coat paint. They also offer great training videos for installing steering bearings along with recommended specialty tools to assist in the process. It came with everything I needed including dust seals and o-rings. Installed the all balls steering stem bearings in my son's bike. Everything was perfect, the fit was spot on and the install went very easy. He only has one ride since I replaced them but everything seems to be great. I would definitely recommend the all balls steering stem bearings kit to anyone. I have used all balls bearings in the past and have never had any problem with them. Fitment and ease of installation was normal. To early to tell just yet. However they went on easy and first ride they felt good. We will see how long they last,probably like all others which are about a year. Purchased for a YZ250, this kit had everything needed, and then some. 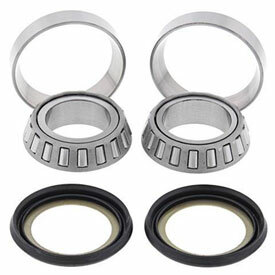 Both upper and lower bearings and races and seals seem to be of good quality. A few notes: This kit was designed to fit a wide variety of bikes, so it came with additional pieces that are unnecessary for all bikes, yet there were no instructions, nor any indication which parts were needed for what bike; basic instructions are available online, but it's a bit disappointing that All Balls doesn't include specific instructions and parts diagrams, as this may confuse those who are new to wrenching on bikes. 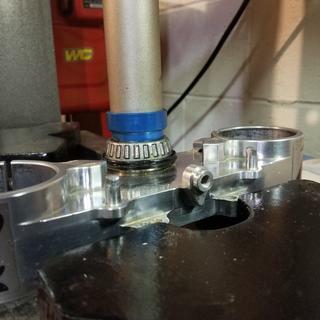 Additionally, the upper bearing did not look like the stock bearing, which didn't affect performance, but may throw off the average installer; again, All Balls should probably include paperwork explaining this to consumers. Bought the steering stem bearing kit for my kids KX85 and they have held up to all the abuse of racing. So, decided to redo my YZ250 with All Balls bearings - great fit and a good price. Fit like a glove ! Smooth sailing all day long, & good quality fast shipping...! I always choose All Balls bearing because they are affordable and reliable.. I have been using them since I started doing my own work on my bikes and I have never had a failure or fitment issue that wasn't my own fault..
Bought them to restore a bike, works as expected. I've used them before so I expect they'll last. same as the one I took out fit like a glove. we will see how long it last. I would buy it again. Perfect fit and inexpensive and fast shipping. Deffinitly will buy again. Complete kit includes seals as well as the bearings. Costumer service was great, like always. The steering bearings fit like a glove and were easy to install. They seem to be of good quality and improved the steering on my atc. Just be sur to pack the bearings with a good quality grease. Do these bearings work for the top and bottom of the Arctic Cat 250 steering stem? Does this kit include the top and bottom bearing for the stem or do you need the get two kits? Does this product come with races as well? BEST ANSWER: Yes. Kit was used on 2015 Honda CRF 150RB. The replacement parts have held up great. Have a 2005 yz250 with 2010 forks and clamps.. should I order for 05 model or 2010? BEST ANSWER: The steering stem bearings are the same from 1996 to current 2019 YZ 250's. You can order for either year and they will work. Will this fit my 2015 cobra sr? 2012 KX250f, OEM parts does not show a top seal. Does this kit come with a top seal? BEST ANSWER: The kit comes with 2 seals and 2 tapered bearings. i have a 2002 yz 250 frame with 2008 yz450f forks will this work? BEST ANSWER: What triple clamps do you have? will this fit on my 1996 honda 300ex? Do these bearings work with a lonestar steering stem on an 05 honda trx450r? BEST ANSWER: These will be OEM replacements. If the Lonestar Steering Stem has the same specs as OEM then these will work. You may need to check with Lonestar if you are unsure if they are made to OEM spec. is this for 2014 cobra senior. and does it come with 2 of each? races,bearings,and seals? BEST ANSWER: I show that these only fit up to a 2013 model.